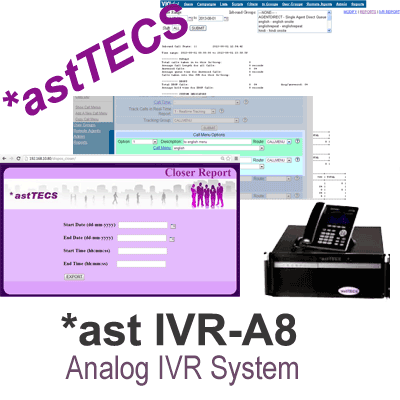 *ast IVR-A 8 is the complete IVR system with 8 analog ports, capable of handling upto 8 analog lines. IVR or Interactive Voice Response is the technology that enables interaction between a caller and a computer via the telephone. Callers can interact with IVR systems by pressing numbers on a telephone keypad or by speaking simple commands to answer the computer's voice prompts. Common uses of IVR include account balance inquiries, finding store locations and simple caller identification and routing. Analog IVR comes with analog FXO card (4 port / 8 port). Here the normal analog lines are connected to the system. IVR technology is most commonly found in the offices / call centers of companies seeking to improve their customer service, reduce costs, and expand their call center operations.